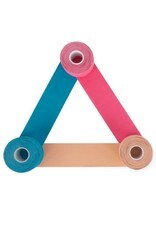 Suffolk Kinesiology Tape - Dance Gear Etc. Kinesiology Tape is a lightweight and flexible tape with great adhesive qualities that can stretch and recoil with the skin while the body is in motion. Rehabilitative taping is designed to facilitate the body’s healing process, while providing support and stability to muscles and joints without restricting the body’s range of motion. Taping can also provide extended soft tissue manipulation to prolong the benefits of physical therapy. Suffolk recommends following a doctor’s or physical therapist’s instructions on taping. Each adhesive strip is 5cm wide and 25cm long.